I wanted to mention an important action that’s happening today at 5:00pm in Herald Square (34th Street and 6th Avenue) in case you are nearby and can join us. The action is focused on raising the minimum wage. It was planned by OccuEvolve in conjunction with other Occupy groups, including Alternative Banking which made a bunch of signs this past weekend, in solidarity with the 75th Anniversary of the passing of the minimum wage law. The idea is to demand raising the minimum wage to at least 15 dollars a hour. I’ve never done the math on how it would be even close to possible to live on an hourly wage of $7.25 but it’s clearly not possible to, say, budget for emergencies even in the most frugal of approaches. While employers like Wal-Mart seek to reap significant profits through the depression of labor costs, the social costs of this low-wage strategy are externalized. Low wages not only harm workers and their families—they cost taxpayers. Let’s demand better tonight at 5:00pm in Herald Square. And what of everyone making between 7.25 and 15.00 now? Isn’t this a net negative event for them since their relative earnings power will drop? I question the report itself. The “Democratif staff” of the US House Committee on Education and the Workforce?! The political bias in this report is staggering, can you really trust it? There has been a lot of research in economics trying to estimate the impact of minimum wages on employment. Some studies have found evidence consistent with the view that they increase unemployment, some have found that they may have no apparent effect one way or the other, and I believe there are even some studies which suggests that they can increase employment. Card and Krueger (spelling?) wrote an older book on this topic. There is also a newer one that I can’t remember the name or authors of but a search online should unearth it. I suspect that there is some minimum wage that under certain conditions would result in an increase in unemployment but I don’t know what that wage is and it might or might not be 15 dollars per hour. 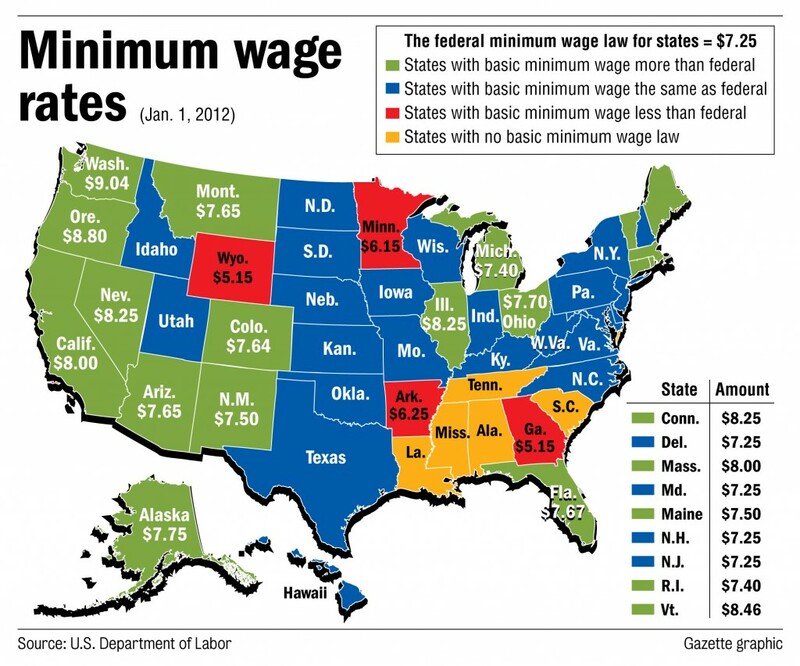 I’m not sure what the purpose is of showing states with no minimum wage or less than the federal minimum wage. Employers in those states are still required to pay the Federal minimum. Minimum wage is one of those things where getting the number right probably matters a lot. Obviously, having a mandated minimum wage of $100/hour would be ridiculous. Equally obviously, current minimum wage of $7.25 is not ridiculous, as far as not hurting the corporate profits too much is concerned. Presumably, somewhere in between there is an optimal minimum wage amount, under some definition of “optimal” (as in, helps the employees enough without pushing too many people over to the cash-under-the-table economy). It is especially strange to read that in Mathbabe’s post right after her ranting against the economists arguing for social policy without proper scientific justification for their conclusions. Apparently, arguing for budget cuts via faulty research is not ok, but arguing for a higher minimum wage via “Wallmart makes too much money, and their employees are all on Medicaid” is apparently totally fine. It is not that I disagree with the conclusion; perhaps our minimum wage should be $15/hour. I am very much fond of policy based on empirical research, and usually I like this blog for arguing this point. It is painful to see examples of “do as I say, not as I do”. As I said in my post, I didn’t do the math. And thus I am not claiming to have a mathematical model behind my argument for a larger minimum wage. Instead I think that, on moral grounds alone, we can argue for doubling the minimum wage. It is clearly too small. If we get it wrong we can adjust. They seem to conclude that the optimal minimum wage is between 1x and 1.5x the market wage that would prevail in absence of a minimum wage (tables on the last two pages). Now, given that there is a minimum wage policy, how do you estimate the market wage thath would otherwise prevail? I’ve got some ideas that maybe I’ll try to flesh out later, but it seems fair to assume it would be lower than the current minimum wage. Taking all the top figures that I see available gives me an upper bound of $12.69 (1.5x multiple, 8.46 from the highest state minimum wage). I don’t know the authors of that paper, but I did find it via a string of conservative economist blogs. (a) maybe the real problem with low wage jobs in the US now is that they don’t build human capital, so they aren’t a bridge to something better. (b) the stability of the high profit share of GDP/low labor share of GDP is a puzzle. Most experienced value investors expect (fear?) this will correct at some point, but they have been thinking this for a while now. My best guess is that it shows a relative improvement in managers’ abilities to automate away from or otherwise reduce labor inputs to production which, in turn, suggests that the unemployment consequences of a higher minimum wage might be larger than historically experienced. Not everyone depends on a job for survival, but making some extra cash is nice. 20 hr/wk at minimum wage may represent upkeep for nice hobby, rent payment, or car plus gas money. Minimum wage is a tool to prevent exploitation, it is not meant to support a family. Without flattening the compensation pyramid, all that the minimum wage increase will achieve is either higher unemployment or more inflation, either way, it will increase the misery for the bottom half or more of the population. So, if you want to help, analyze the trends of min and median wage and average net worth of Forbes 400 in inflation adjusted dollars. See if anything jumps at you. I don’t see why people think this except for the fact that it’s the stiry spooned out by corporations. Corporate profit is at an all time high. They can afford to pay more!! I suspect that you and I are on the same page when it comes to whether we align more with the employer or the employee in this situation. But I’m not sure if it’s a question of whether corporations can afford to pay more. It might be more about whether they are willing to pay more. If the minimum wage is increased and results in lower profit, even if the lower profit doesn’t hurt them that much, a business might lay off workers or increase prices to get their profit back up if they thought they could get away with doing so. Part of preventing them from doing this might be making the kind of moral case I think you’re trying to make to perhaps shame them into doing the “right” thing. But there are some (in full disclosure I’m one of them) who’ve been thinking about another approach to providing economic security called a basic income or social dividend. The idea would be for the government to set a minimum income that no one’s income would be allowed to fall below whether or not they sold their labor. The tax rate would be set so that those who did sell their labor would end up with a higher net income than those who just lived on the minimum (to maintain a work incentive). If the minimum were set high enough this could put pressure on employers to pay workers enough to make working worthwhile instead of living only on the minimum income. But it wouldn’t cause unemployment or if it did it wouldn’t matter as much because people could live for an indefinite amount of time on the minimum income. This obviously goes against the “work ethic” that’s very ingrained in this country but from a policy perspective it might mitigate a potential problem of the minimum wage—its potential effect on unemployment. I suppose a basic income could still be inflationary though. 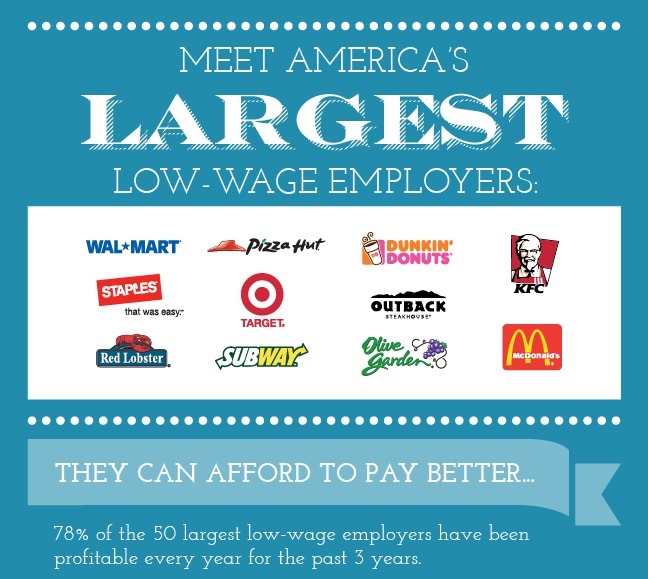 I totally agree that each employer will seek to maximize their profits. I get that. I just mean that raising the minimum wage doesn’t _necessarily_ mean laid off workers. It could also mean companies just lower their profits. It could happen, for example when they can’t automate any further. The point is it’s a different scenario than in a situation where there is no profit at all, so raising wages forces companies to fire workers. OK, moderator, please just delete it. If your goal is to guarentee that everyone has at least a livable income then why don’t you fight for a guarenteed minimum income. Even many libertarians support this. It also doesn’t tie a person well being to one particular employer. We’ve seen how well tying healthcare to an employer has worked out. Minimum wage legislation seems like the least likely way to help the poor. I don’t know if the minimum wage is the least likely way to help the poor, but a guaranteed minimum income is exactly what I was proposing. Another name for it is the basic income (or sometimes the basic income guarantee). I’m not sure what the policy goal or goals of a high minimum wage are. Perhaps Cathy will enlighten us. But I don’t think ensuring everyone has a livable income is one of them. Notice that neither the words “poverty” nor “poor” appear in the post or the ensuing discussion (well, until your post), while forms of the word “profit” appear many times. 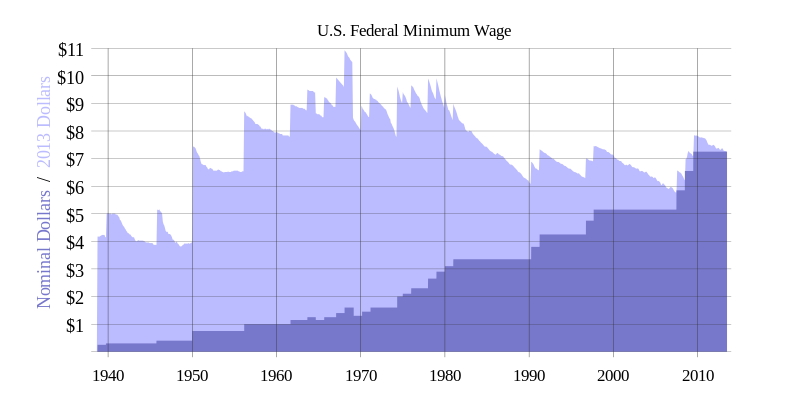 Most evidence suggests that raising the minimum wage above market rates decreases minimum wage employment. Also, current minimum wage laws are not universal. There are many jobs that are exempt from it, and there’s evidence that increasing the minimum wage leads to a significant increase in below minimum wage employment. I suspect the policy goal is primarily to force companies that profit from significant economies of scale, and nominally higher per-worker output, to book less profits and pay workers something more in line with their output rather than their market wage. This is effectively putting a limiter on economies of scale in enterprises with large numbers of low-wage workers. A secondary goal may be to enable small businesses, which depending on how the minimum wage policy is formulated may be exempt from it, to more effectively compete with the large corporations. So I think this is more about reducing income inequality and balance of power between workers and corporations than it is about reducing poverty. A minimum income or similar could effectively and directly address poverty, and empower low wage workers a bit more because not working would become a viable option, but overall would do effectively nothing to reduce income inequality or reduce the power of large corporations. The minimum wage seems like the wrong way to attack the problem. It’s a little like attaching health insurance to a job … these people are still doing better than the person who just missed out on the burger-flipping job. The minimum income should be independent of the job.